Local workspaces are also great when you want to quickly build up some history within a branch. For example when you want to build a demo, or if you are migrating sources from another system. Local workspace allow you to add, delete and modify files without notifying the server, so this makes life easy. We have some source code from 3 versions and want to store this with history in TFS. Go to step 2 use Version 2,3,etc. The local workspace “knows” which files are modified so this works great. You can imagine that if you have a lot of these actions, it is nice to automate this. 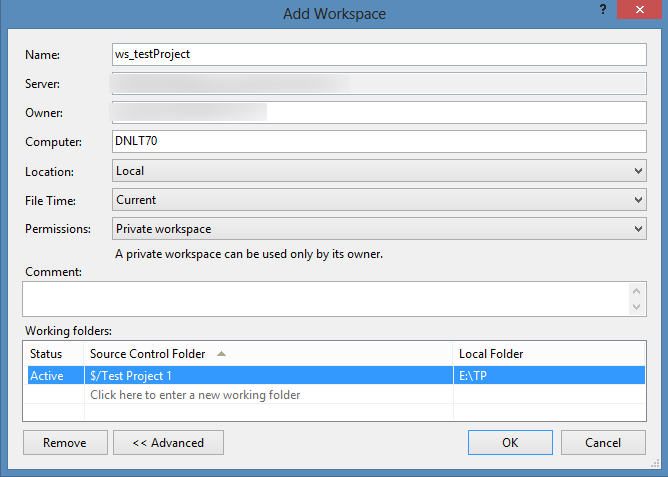 You can use TFS API for this and use the VersionControlServer object to make use of the TFS Version Control API. You can find MSDN reference here and great examples of connecting to the Object model here. ws.PendAdd, moves the excluded changes to the pending changes and the pending changes are checked in. However, when we remove the files from MAIN and copy Version 2, the following happens. So, how do we get this deleted file in our included changes as well? The workspace also has a method GetPendingChangesWithCandidates, which actually gets all the “Excluded” changes. Now we know this,it is a matter of promoting these candidates. It is al little bit different because we have to have a ItemSpec array. This is the serverpath of an item. E.G. $/TestProject/MAIN. I use the ws.GetServerItemForLocalItem to translate the workspace local path to the server equivalent. We loop through all candidates and check whether we have to add them (PendAdd) or Delete them (PendDelete). Edits are always included by default. After the loop we can just checkin all our changes. How do you get the excluded .dll and other files that were excluded due to the file extension? I am not sure. I did not test that. Seems to me it is just a file and it can be added the same way.